Many dog owners prefer using a harness to a collar. Harnesses reduce stress on the dog's throat, according to the Puppy Harness website. Some pet owners clip a leash to both the dog's collar and the harness to walk him. This can reduce choking, and help the owner guide the dog. A harness fits around the dog’s front legs and over the back. 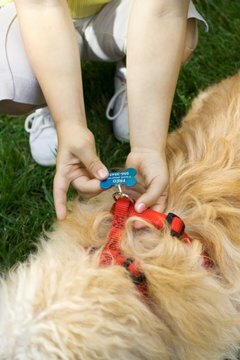 Because harnesses do not sit around the neck, some dog owners also use a collar to hold the dog’s identification and rabies tags. Pet supply stores sell harnesses in various sizes to fit different breeds of dogs. A good harness fits the dog’s figure without cutting off circulation. Open the clasp or fastener on the harness. Turn the harness in your hands so the two loops face forward. Let the dog smell the harness for a minute or two if he wants to. This helps him become more comfortable with the harness. The more he wears it, the more comfortable he feels with the harness. Put the harness on when the animal is calm. If the dog is agitated beforehand, it can make it harder to fasten the harness. Tell the dog to sit. Lift one paw and slip it through one of the front holes. Slip the other paw through the other hole. Pet the dog to keep him calm while you put on the harness. If the dog twists around or tries to wriggle free, speak to the animal in a calm tone to reassure him. Wrap the two ends of the harness around the dog's middle and close the clasp. The ring for the leash or tie-out to attach to should be on top of the dog. Use the sliding adjuster to loosen or tighten the harness. You should be able to slip your finger between the harness and the dog without feeling constricted, but snug. After the harness is on, give the dog a treat. Clip a leash or tie-out on the ring of the harness. If you use both a collar and a harness, attach a leash to both items. If the harness is new, the dog may try to scratch it or bite it to remove it. After several uses, most dogs leave the harness alone.